Coffee Harvesting Field Day - Kona - Welcome Coffee Growers! https://bit.ly/2DAmLb1, or by contacting Gina at 808-322‐4892 at least two days prior to the event - on a first come, first served basis. Park and meet at the Kona Cooperative Extension Office. We will walk up to the pruning trial plot as a group. UH-CTAHR’s Cooperative Extension, USDA ARS’s DKI Pacific Basin Agricultural Research Center and the Hawaii Department of Agriculture welcomes you to an exploratory trial of four different coffee pruning techniques. This harvest field day is a follow-up event to the Feb. 28th, Mar. 1st, and Jun. 14th pruning and desuckering field days where the following pruning techniques were demonstrated at the Kona Research Station. The objective of this pruning trial is to compare the above methods for yield, labor requirements, harvesting considerations, and impact on CBB management. 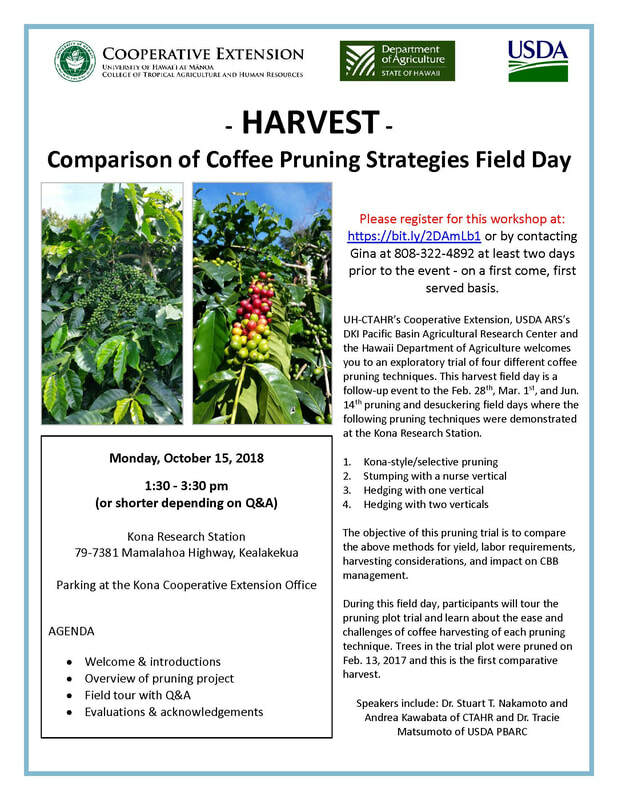 During this field day, participants will tour the pruning plot trial and learn about the ease and challenges of coffee harvesting of each pruning technique. Trees in the trial plot were pruned on Feb. 13, 2017 and this is the first comparative harvest. Click the photo to download the event flyer. If you register and are unable to make the workshop, please contact Gina at 808-322-4892 or Andrea at andreak@hawaii.edu as soon as possible. There may be a wait list and we would like to provide someone else with the opportunity to attend the workshop.